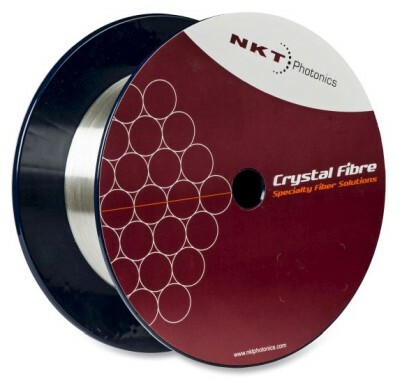 The RP Photonics Buyer's Guide contains 7 suppliers for large mode area fibers. Large mode area fibers are sensitive to bending, fiber imperfections, gain guiding etc. such effects can be investigated with numerical simulations, using the software RP Fiber Power. For some applications, it is desirable to use optical fibers with particularly large effective mode areas (LMA fibers) – often still with single-mode guidance. Due to the reduced optical intensities, such fibers effectively have lower nonlinearities and a higher damage threshold, which makes them suitable for, e.g., the amplification of intense pulses or single-frequency signals in fiber amplifiers, or in the case of passive fibers for delivery of such light. Whereas standard single-mode fibers have an effective mode area below 100 μm2, large mode area fibers reach values of hundreds or even thousands of μm2. For a large mode area, one requires a large fiber core. 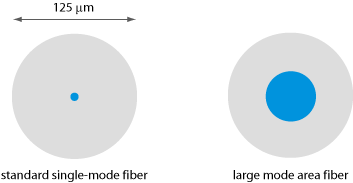 However, large-core fibers do not necessarily have large modes, if they are strongly multimode; at least the fundamental mode may then be much smaller than the core. Note that waveguide dispersion becomes weak for large mode areas. Therefore, there is limited scope for tailoring the chromatic dispersion of large mode area fibers. Figure 1: Comparison of bare (uncoated) fibers with a standard core size (e.g. 8 μm diameter) and a large core (50 μm diameter). A straightforward design approach to obtain large mode areas is to decrease the numerical aperture (NA), i.e., to decrease the refractive index difference between the core and the cladding, for a step-index fiber design (see Figure 2). However, there are severe limitations: the guidance (waveguiding) then becomes weak, and significant losses can arise from small imperfections of the fiber or from bending (→ bend losses). 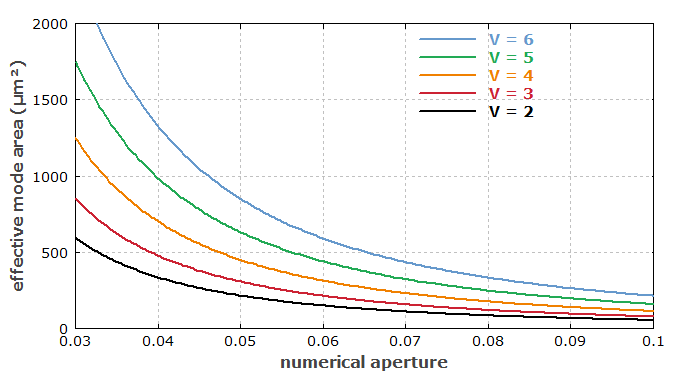 Therefore, the numerical aperture should normally not be made smaller than approximately 0.06, although in extreme cases values as low as 0.04 have been used . Figure 2: Effective mode area of a step-index fiber as a function of numerical aperture (NA) for different values of the V number. Large mode areas can in principle be achieved even with V = 2, i.e., with strictly single-mode guidance, but this requires the use of a very small numerical aperture, which implies a critical dependence on refractive index inhomogeneities and bending. There are additional difficulties in applying this concept to rare-earth-doped fibers. Relatively high concentrations of additional dopants are often required, e.g. for reducing certain quenching effects, and these dopants often increase the numerical aperture. Even if the refractive index contrast can be reduced in some way, the precision of refractive index control may be decreased, and this affects the ability to realize very large mode areas. Somewhat larger mode areas can be achieved with fiber designs supporting a few propagation modes (→ multimode fibers). It may then still be possible to guide light dominantly in the fundamental mode, so that the output e.g. of a fiber amplifier is close to diffraction-limited [1, 2, 5]. Stringent limitations arise from the more critical launch conditions and from mode mixing in the fiber, which can spoil the beam quality and lead to beam pointing fluctuations . One may strongly bend the fiber; depending on the fiber design, the induced bend losses may be substantial for higher-order modes at a point where they are not yet significant for the fundamental mode. Fiber designs can be optimized in that respect. Note that bending not only introduces losses, but also can reduce the effective mode area. This is particularly true for large mode area step-index fibers. For a fair comparison of fiber types, this effect definitely has to be taken into account . It turns out that some fiber designs have a large mode area without bending, but a much reduced mode area with bending, whereas there are other designs (e.g. with a parabolic index profile) where the mode area starts with a somewhat smaller value but is much less sensitive to bending. So-called chirally coupled core fibers [12, 21, 33] have a straight central core in which the signal propagates, plus another core which is helically wound around the central core. It is possible to obtain strongly selective coupling of the helical core only to higher-order modes of the central core, while leaving the fundamental mode essentially unaffected. The principle of this selective coupling is that the helicity affects the propagation constant in such a way that at least in some limited wavelength range phase matching occurs only for coupling to higher-order modes but not to the fundamental mode. In leakage channel fibers [7, 11], the core is surrounded by a small number of large holes, making all propagation modes leaky in a very selective way, such that all higher-order modes but not the fundamental mode experience substantial propagation losses. While earlier versions of such fibers have been made as photonic crystal fibers with air holes, solid all-glass designs are also possible . Pixelated Bragg fibers are modified versions of so-called Bragg fibers, i.e., fibers with a sequence of high-index rings fulfilling a half-wave stack condition. Here, the high-index rings are made discontinuous (pixelated) such that the propagation losses become high for higher-order modes while remaining low for the fundamental mode [35, 37]. Such fibers can be fabricated with stack-and-draw techniques. The best fiber designs reach an effective mode area of several thousand μm2. There is not a strict limit, but designs with larger mode areas exhibit less robust single-mode propagation and often can tolerate only very slight bending. It appears that no kind of design can offer a further substantial expansion of the mode area with robust single-mode propagation. The reason for this is essentially that a mode involves some balance of diffraction and waveguiding, and as diffraction inevitably becomes weaker at larger mode areas, this balance becomes more and more sensitive to any disturbances. In high-power fiber lasers and amplifiers based on large mode area fibers, thermal lensing can lead to changes of mode properties, in particular to a reduction in effective mode area . The problem of refractive index control can in some situations be mitigated by using a multifilament core, where the fiber core is realized as a two-dimensional array of filaments . As each single filament exhibits only weak guidance, the overall structure can exhibit single-mode guidance. This concept is particularly interesting for erbium-ytterbium-doped fibers. A relatively novel concept is that of the gain-guided, index-antiguided single-mode fiber [6, 14, 22, 26], which is a type of active fiber. Here, the unpumped fiber is not guiding (even antiguiding), as the refractive index of its core is lower than that of the cladding. For sufficiently strong pumping, however, gain guiding can stabilize a leaky mode with high beam quality. As the losses of such a mode rapidly decrease for increasing core size, a fairly moderate laser gain can be sufficient to achieve propagation with positive net gain if the core is large. Higher-order modes also exist, but would require a significantly higher gain. That level of gain is not reached when the lower-order mode saturates the gain, as it easily happens in a laser, but not necessarily in a high-gain amplifier. The greatest challenge of this concept is efficient pumping. Note that the pump light is not guided and even expelled from the doped core by the index structure and the absorption. A diode-pumped fiber laser has been demonstrated with this concept , but novel pump arrangements will have to be developed to allow for efficient operation. One can use a tapered fiber as a mode converter between the two fibers. The tapered fiber must be made such that the mode size matches that of the large mode area fiber on one end and that of the standard fiber on the other hand. One then has to do two splices instead of one, but each one can have very low losses. The main difficulty with that method is that a tapered fiber is needed, which may not be easy to obtain. A frequently used solution for laboratory experiments is to use free-space coupling from and to the large mode area fiber. A laser resonator may then be made with bulk components only, apart from the active fiber. This leads to flexible laboratory setups, which however are not very suitable for commercial use, as they involve sensitive alignment and are sensitive to dust, particularly to dust deposited on the fiber ends. Normally, a large mode area fiber is understood to be a fiber which has a single guided mode for polarization direction or only very few modes. However, one can also obtain a large mode area by utilizing a high-order mode of a multimode fiber [10, 20, 34]. In practice, one can first couple light from the fundamental mode to a particular higher-order mode, using a long-period fiber Bragg grating. Thereafter, light can propagate in that mode e.g. in an amplifying fiber, and finally it can be converted back to the fundamental mode with another fiber Bragg grating. The advantage of using a higher-order mode is twofold: such modes have larger effective mode areas, and they exhibit a weaker coupling to other modes. The power losses associated with coupling to and from this higher-order mode can be small, and the fiber design can be optimized for a broad bandwidth for this coupling. However, difficulties with that HOM fiber technique might arise from the very uneven intensity distribution. This can lead to fiber damage even in a regime where the overall nonlinearity is moderately strong, so the approach may solve problems with nonlinearities but not those with damage. Also, the mode field significantly extends into the cladding (the inner cladding in the case of a double-clad fiber), which is not ideal for amplification.